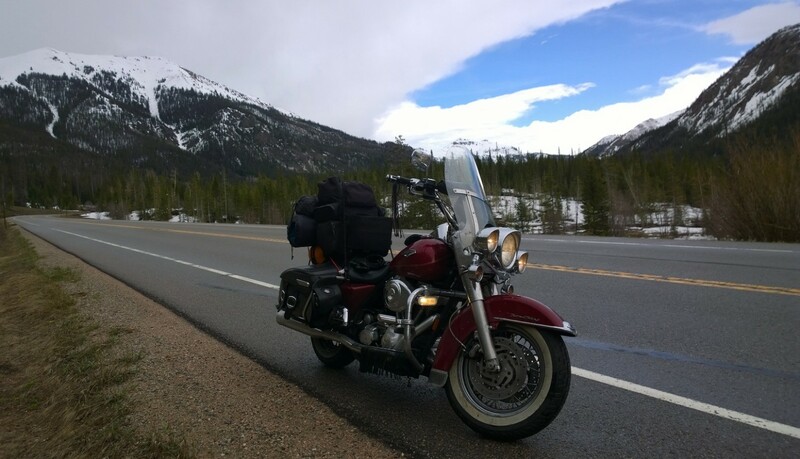 A Motorcycle Ride Against Cancer; Because No One Should Journey Alone. 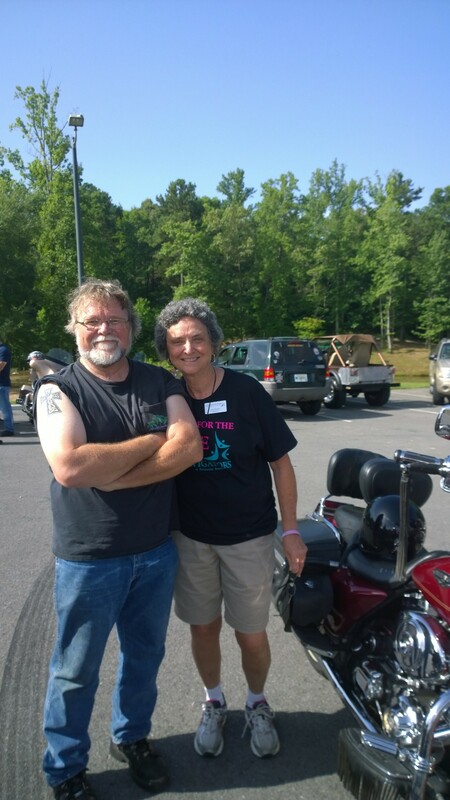 Yesterday, along with around 60 other bikers, I took part in a motorcycle ride in memory of Darlene Bagley, with all the proceeds going to Cancer Navigators of Rome, Georgia. Big Red and I had to leave early in the morning to get to Adairsville in time, especially, since it included a stop at Hardees first for a biscuit and coffee. It was only 74 degrees when I left (It would reach 96 later) and patches of mist were still ghost hovering over the Oostanaula River. The farmer’s market at Ridge Ferry was open, walkers were sauntering down the path along the river and folks were already trickling into yard sales. A veil of blue grey mist hung on the hillsides in the trees. A breeze rippled across their tops making it look like the trees were still rubbing the sleep out of their eyes. After fueling up on coffee and a biscuit I headed to the park in Adairsville and found bikes, cars and police escorts in a lot near a large covered area. I went in and registered, bought a tee shirt and took stock of the gathering. Men, women, children, a St Bernard and a black kitten meowing in a travel box. Most of the riders were men though I saw at least two women bikers. Folks wore Harley shirts, some sleeveless so you could see their upper arm tattoos. Others wore black and pink Cancer Navigator shirts and other tee shirts. Heads were adorned with Harley and American flag skull caps. A number of men had leather vests stitched with the names of their organizations: Missionaries on Bikes, Cruisers for Christ, Biker’s against Child Abuse and OBK – which I found out later, stood for Outrageous Beardsmen Koalition. I kid you not. Since my biker name is Monk (Long story –not that exciting) I thought about creating a group called Monks on Motorcycles. The logo could be a hooded monk on a Harley Road King and above it M.O. M. Okay, maybe not. After a brief speech on the amazing supportive work of the non-profit Cancer Navigators, and a few testimonials and a prayer it was almost time for “kickstands up.” I ran into a friend Carol, herself a cancer survivor, who said she would love to go on the ride with someone. I usually ride without a sissy bar and an extra helmet but before leaving that morning “something” told me to put one on the bike, so I did. She hopped on and the big procession began rolling slowly over the speed bumps out of the park. I love these police escorted and intersection-blocked rides. We zoomed down the highways enjoying the thrill of running red lights! We cascaded over the shadowed, narrow back roads and the wind created from our bikes caused the trees to shake in support. Almost looked like they were waving at us. Okay, not the whole tree waving in support, maybe just a few branches. Carol did her fair share of waving to folks who had parked their cars on the sides of the roads as a sign of respect. We did about 85 miles through the foothills and forests of Northwest Georgia, passed farms, ranches, fields, wet bottomlands, lakes and thick forests of pine, oak and maple. Pink flowers from Crape Myrtles, yellow dandelions, blooming Mimosas and purple flowers dotted the countryside. The sky was blue with wispy white clouds. It was beautiful. After about 1 ½ hours of riding we were back, hearts soaring even though many butts were sore-ing. A great ride. Afterwards there were soft drinks, burgers and hot dogs and the fixings. Camaraderie, hugging, back slapping, jokes and folks telling stories ensued until the auction for donated cakes and baked goods began. (An Italian Crème Cake went for 80 bucks!). Then the raffle began. I watched for a while and then skedaddled with a lot on my mind. For me this wasn’t just a charity ride. It was a big reminder about some important things.It reminded me about how a small group of people can change things. How a group of professionals gave up large salaries and started a non -profit for the sole purpose of supporting cancer victims and their families, folks usually abandoned to find their own ways after the diagnosis has been given. How one man started a benefit ride for his wife and kept it running every year to raise money. How folks and businesses contributed their cakes and their prizes to help raise even a bit more money for the cause. How families were brought together, families of friends, supporters and bikers. It was more than just a charity ride. All these people felt good about having an opportunity to show their compassion, to be a part of larger cause, to contribute in their own way. It was a beautiful thing! I rode home overwhelmed by the heat and the gratitude in my heart. I can’t contribute much, but I can ride.